This dead caterpillar of Carcharodus alceae was found on the 6th of September, 2009 in a meadow (Franche-Comté, France) ; it was surrounded by nine white silken cocoons. The larva had been using Malva moschata as a foodplant and also as a support for building a harbor. The caterpillar had made this harbor by folding leaves and by linking them with silk. In this species (and generally among Hesperiidae), the harbor is supposed to protect the larva from predators and parasitoid insects... which failed in that case. These cocoons are the result of an invasion of the larva by some parasitoid insects ; this insect is here Cotesia glabrata (superfamily Ichneumonoidea, family Braconidae, subfamily Microgastrinae). A the very beginning of the wasp cycle, a female wasp lays some eggs on the caterpillar's tegument (or through it depending on the wasp species) ; then the eggs hatch giving rise to small wasps larvae that will grow inside the caterpillar . The larvae behave like parasites during several weeks, eating the caterpillar's fat from the inside without killing it.... when big enough, the wasps larvae looking like maggots finally get out of their host (drilling holes through the caterpillar's tegument which leads to its death) ; as soon as they are out the maggots start to spin a silken cocoon and pupate inside it. This is an example of parasitoidism, which is an amazing kind of relationship between two species differing from predation (=immediate death of the prey) and differing from typical parasitism (=no host killing by the parasite). The white cocoons found around the caterpillar were collected and kept in a transparent box at room temperature during the following days. 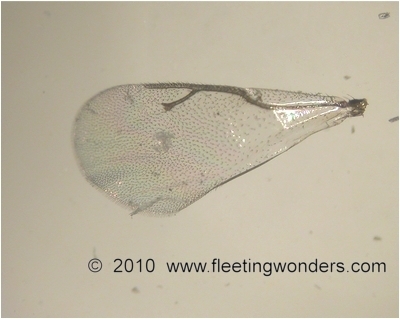 The 18th of September, tiny wasps (length=1mm) emerged from the cocoons . Normally, Cotesia glabrata wasps were expected.... but here something special occured. 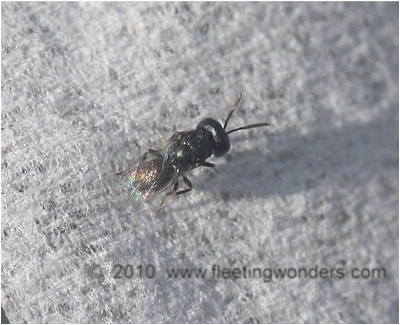 The close observation of these insects (especially the general aspect of the wings and the shape of antennae, see below) lead to the identification of a chalcid wasp (superfamily Chalcidoidea). 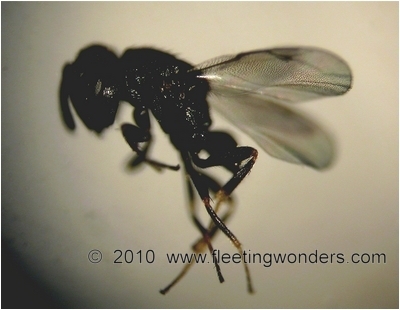 These wasps are among the smallest species within hymenopterans. In fact, they are in this case parasitoids of the Cotesia glabrata, which is an example of hyperparasitoidism (i.e. parasitoidism of a parasitoid) ! This explanation was kindly given to me by Dr Mark Shaw, from the National Museums of Scotland. The chalcid wasp found the cocoons of Cotesia glabrata, then laid some eggs within the cocoons. The chalcid larvae achieved their own cycle by parasitizing the Cotesia pupae that finally all died. Additional information : apart from this particular case of hyperparasitoidism, some parasitoid wasps are intentionally used by humans for fighting against crop pests (such as bugs larvas or moths whose caterpillars eat cultures) ; a given species of chalcid wasp is often a parasioid of a specific insect ; this is a biological way for reducing the pest population, much better than pesticides (provided the wasp action is well targetted, remains under control and does not do harm to unexpected species). In a way parasitoids are biological agents useful for regulating populations of butterflies....without this natural regulation, butterflies would become too numerous which would be harmful for the whole ecosystem.